FansVoice: An ardent fan who has brought attention to the many hundreds of Australian footballers plying their trade across the globe. Well known on social media, and never one to step back from a discussion, Adam Howard has some of the most insightful and passionate views on the future of Australian football. Hear his story.. I grew up in a small coastal town in South Australia. It was an Aussie Rules area so I played that and basketball in the summer for my early years. 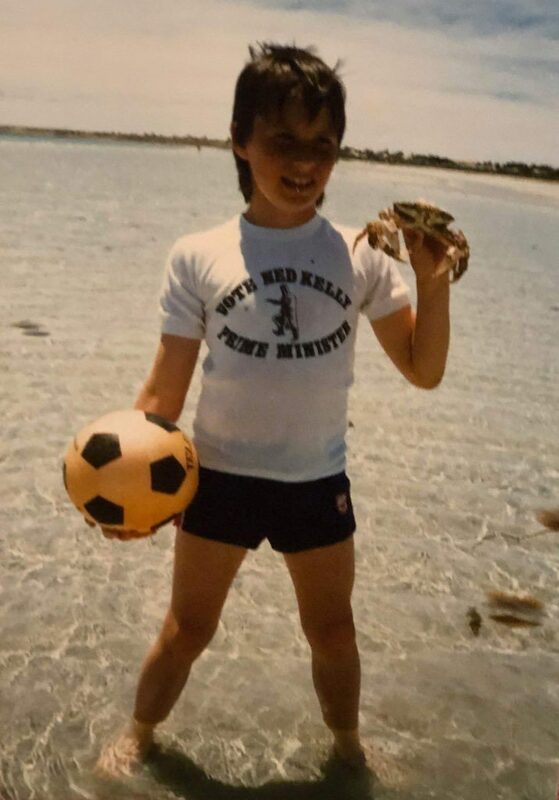 I moved to Adelaide for high school and attended a private Catholic college where I was introduced to the round ball game. My serious interest in Football came from moving to the city and having to make new friends. I found at my school that there was a lot of ethnic diversity compared to where I was from but almost every group was connected by a shared interest in football. Going to my friend ’s houses, their families also loved football so I naturally became more and more interested in it. By the time my interest in football began, I was already committed to playing basketball and then Aussie Rules. The three sports were all inter school sports played in winter too, so I had to choose only one. I was nowhere near good enough to play football for our school teams and we were not allowed to play sport outside of school so I couldn’t ’t find a level appropriate club. So my early forays into playing was lunch and recess in small-sided games. I was generally on the “others” side which comprised of anyone from a group with few football fans. It was a lot of fun and I found some things that I picked up from basketball and Aussie Rules served me well, especially defensively. My earliest memory of watching football was seeing Adelaide City and West Adelaide on the TV as well as SBS highlight shows and Match Of The Day. As far as watching full games and tournaments, it was probably the 1992 Olympic qualifying and 1994 World Cup qualifying tournaments that stand out to me. Everything before than is blurred out because I was much more a doer than a watcher back in the day. I remember, during high school, every Saturday night lying in bed with the transistor radio listening to the Premier league on the BBCWorld Service. I loved when they gave the pools score and would go around for updates around the ground. You could feel the atmosphere whenever they crossed to the grounds. I really enjoy travelling, but I’m more a foodie when I travel rather than a sightseer. I’ve been to Italy, India and Korea a few times. Mostly though when I have had the time off I’ve just gone back and forth between Australia and Japan. As for traveling for football, I’ve been to Korea to watch a friendly between Australia and South Korea (invitation) and have been to a few places in Japan for ACL and Aussie games. The most memorable place I have visited is Italy, it was beautiful and didn’t cost me a cent. I went there with my mother ’s company and we travelled first class, stayed in the best hotels and got VIP access to places like the Vatican. It was such a cool trip ! India was very different but really cool. The food was superb and everything was so reasonably priced. Also I got to meet my then 10-month old nephew for the second time since he was born, I returned to Japan within weeks of his birth. Traveled there with a couple of mates too, so it was a lot of fun to share that experience. 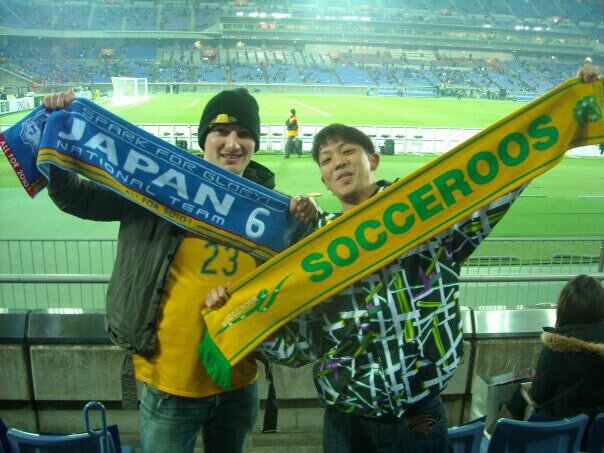 My most memorable fan experience would probably be a World Cup qualifier in Yokohama between Australia and Japan. The game was pretty dire to be honest and finished nil nil. The atmosphere was amazing though and people were very friendly especially considering I was the only Aussie in that section surrounded by Japanese. I got my ticket from my Japanese friend’s father so I knew I would be on my own but I also knew that Japanese fans are prety welcoming. I once sat in the Sanfrecce section with an Adelaide United top on during an ACL game. 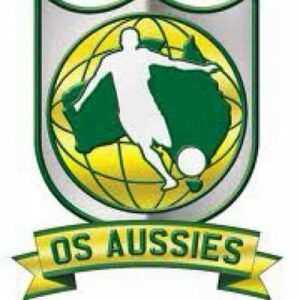 I started OS Aussies because I wanted to know who was playing abroad and how they were doing and most of the updates that were around at the time focussed on Socceroos. That led to me starting Football Central with Ahmed Yussuf and Jason Ganter. I had seen what they had done and was impressed with their work so approached them about collaborating. We were able to do some good stuff with very little finances and even broke some big stories over the years. With OS Aussies, myself, Germanroo and Damian Davies were able to keep people updated and aware of many players who would’ve been forgotten. We were even able to introduce some players to the FFA. Near the end of my time at university in Australia I decided to come and live in Japan to experience a different culture. I’ve now been here for around 16 years. My move to Japan was really just a desire to change my surroundings, challenge myself and experience a completely different way of life. I never had a particular interest in Japan growing up but through my university studies I had a curiosity about the day-to-day social side of Japan. In comparing Japanese and Australian fan bases the biggest thing to stand out is language and I don’t mean native tongue. Australians swear a lot more and focus a lot on the opposition and referees compared to the Japanese. The atmosphere is great at Japanese matches. The Japanese are experts at mimicry. They have seen the fan culture in traditional football countries and they have replicated it with a touch of Japan, as you can see with many of their tifos and songs. This goes beyond just football though, but almost everything that can be found in Japan with origins elsewhere. I’d say the Aussie fans who identify football as their number one sport are much more involved in the inner workings of the politics of the sport, as well as the tactical and analytical side of the sport. I guess this goes with the state of the game and leadership. The biggest thing Australians could learn from the Japanese football structure is probably the importance of having a strategy with real intent. Mission statements are great but without a real plan as to how to achieve goals, they ’re worthless. The Japanese identified what needed to be done to become competitive on the field, first and foremost. They trust in the system and place much more emphasis on the fundamentals rather than just the metrics. Australian football tries to build top down whereas the Japanese recognised the importance of empowering and incentivising the base. They believe if you get as many people involved as you can, the sport will grow and the metrics will take care of themselves eventually. The Future of the A-League ? Aleague is aligned with the rest of the sport, I hope for it ’s success and growth. Expansion is important. You need more games not only for player development but also to make it a fairer competition and prevent the competition becoming stale. However, expansion should come from the lower tiers through promotion. Once 14 to 16 teams is reached at the top, introduce relegation in order to keep teams from getting complacent and development from stagnating. They say necessity is the mother of all invention and this is true in football. If you want to survive you have to evolve. At the moment we rely on artificial levellers but they don ’t work in a global sense because football is too big. We aren’t just competing against ourselves, we don’t have a head start on other nations, we need to follow proven systems within football. I’m confident though in the future of football. We have many good people out there who want reform and who want to to align the sport with the rest of the world. Am I confident we can get those people in positions to make change? Yes, eventually. I look at it like we need our own Big Bang and from that we can grow something amazing. their team but also recognise we need change and they want to be a part of it. It can get pretty toxic online at times and I have found myself getting in arguments with people when at the end of the day it would ’ve been better to just let their comments go through to the keeper. Living and working in Japan though can be a pretty rigid place and sometimes it is an important stress release to engage and have a heated discussion or two online. My day-to-day life is all about respect, positivity, encouragement which is great but occasionally you do need to vent and social media can be a good place to do so. Most of the really interesting things happen in DMs. From media personalities, CEOs, Socceroo legends, and fans, I’ve had a lot of interesting and enlightening conversations. A lot of my positions I have on football stem from these private conversations and the information I’ve had shared with me. A lot of which has to remain private but I’ve found that even though I push for the global standard quite hard at times, many public figures in the sport privately agree with me which is both good and bad at times. Unlike them, I don’t have anything to lose so I’m empathetic towards them that they can ’t attack the status quo so fervently. Having said that there has been some backlash towards the OS Aussies and Football Central sites but nothing that would stop me from speaking my mind. If I could travel 5 years into the future I would love to see a united sport with a clear and defined direction. I believe we are closer to open tiers than many would think. I know a lot of people who are working together and as a result are a lot more powerful than people realise. They are working tirelessly to create a truly integrated football ecosystem which will include the new and the old and I can’t tell you how much I’m looking forward to it. Every person and every club, no matter their background, economics, or ability should feel they are a part of one United football system, free to achieve whatever they aim for.